The house, built in Colonial times, has beamed ceilings and wide-planked pine flooring. breeze, looks out through the trees to the Harbor. A short tenth of a mile stroll down Pine Point Way dead-ends at the Harbor, pictured above. Wellfleet Center and most of the art galleries, boutiques, and restaurants are less than a mile further on across Uncle Tim's Bridge. Wellfleet ocean beaches, from Newcombs Hollow to LeCounts Hollow are an easy 1.5 mile bike ride or car drive away. Ponds are even closer. Views of Wellfleet Harbor from the house, patios, and yard. Dishes and utensils for 10. Full kitchen with standard appliances, dishes, utensils, pots and pans. JigSaw Puzzles, assorted board games, playing cards,. Most in Study/Daybed room. Good sized yard surrounding the patios. Large fenced-in backyard. Well landscaped in natural manner with lots of trees and shrubs, along with open areas. Good privacy from neighboring yards. 1. Large patio off the porch with grills, table with umbrella and chairs 2. Large brick porch in front of house with wonderful view of the harbor. Catches the breeze. 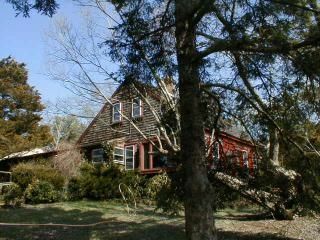 Three bedrooms in the main house and a delightful summer bedroom off the screened porch. Three of the bedrooms sleep two each, the fourth sleeps one. For additional guests, there is the study with comfortable daybed. Three bathrooms plus an outdoor shower. Kitchen is fully equipped with dishwasher and microwave oven, in addition to conventional oven. Washer/Dryer. Cable TV and DVD player. Stereo system - CD, Tape, Radio, MP3/Game jack Gas barbecue grill, charcoal grill, and outdoor furniture. Screened porch leads to a brick patio also with a view of the Harbor thru the trees. Here guests may relax or prepare a meal on the gas grill. Large, lovely, fenced-in back yard. It is quite private and can be accessed from the screened porch and the master bedroom. Pets: Pets are allowed provided guests agree to our pet policy. Please inquire. The many beaches in Wellfleet are unparallelled in their unique unspoiled natural beauty and variety. Choose from wild ocean beaches, calmer Cape Cod Bay and Wellfleet Harbor beaches, and delightful fresh water ponds. Excellent biking trails and nature walks. The beautiful Wellfleet Bay Wildlife Sanctuary. The Cape Cod National Seashore Visitor's Center. The Town of Wellfleet boasts several fine restaurants. with a nostalgic bent, there is also a Drive-in Movie Theatre. offers daily Whale Watching cruises leaving from the town docks.